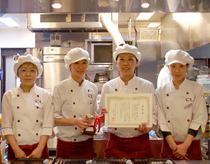 NONOMI’s “GYU Shio Ramen” won the first prize by Ramen contest 2012　in Highway(Sponsorship：Central Nippon Exis Company). "Thank you for selecting us！"
※ Please excuse us, that we can’t accept your request to change the soup style. Copyright ©2011 SHIINO FOODS CO.,LTD. All Rights Reserved.